Lighten up your holiday plate with these easy, veggie-packed recipes that are big on flavor, but much lower in fat and calories than your traditional party fare. These recipes are simple enough for any cook to whip up and take to your next holiday get together. Try one, or all 3, out this holiday season! 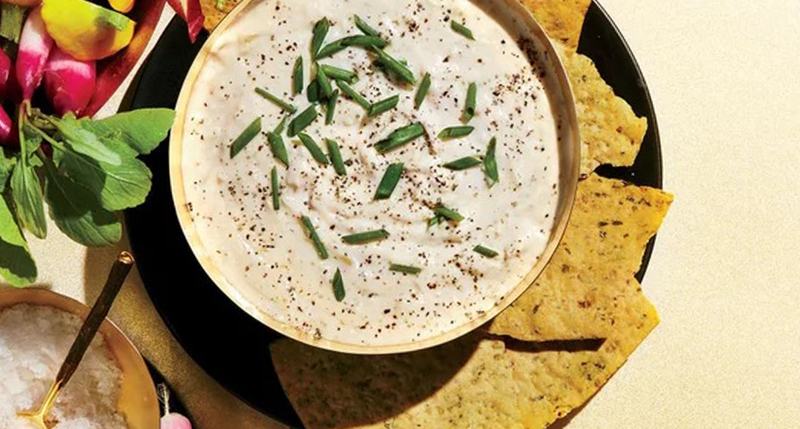 Serves 10; Serving Size: 3 Tbsp dip. Enjoy 3 tablespoons of dip with veggies for less than 150 calories! Veggies for dipping – carrot sticks, bell pepper slices, cucumber slices, etc. Combine beans, Greek yogurt, and lemon juice in a food processor and process until smooth. Heat oil in a saucepan over medium heat. Add shallot and cook until softened, approximately 5 minutes. Add flour and stir constantly for 1 minute. Add stock and stir constantly until thickened, approximately 2 minutes. Reduce heat to medium low and add bean mixture. Stir for 1-2 minutes until heated. Remove from heat and stir in salt, pepper, and herbs. Serve immediately with assorted sliced vegetables. Serves 20-40; Serving Size: 1-2 mushrooms. 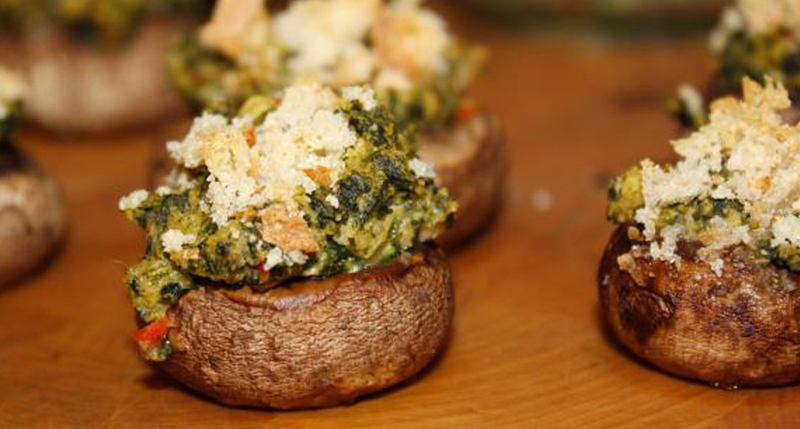 Enjoy 3 mushrooms for less than 100 calories! Remove excess water from spinach by squeezing through a paper towel or cheesecloth. Place mushrooms cap side down on the baking sheet. Combine goat cheese, red pepper, spinach, 1 cup breadcrumbs, salt and pepper into a food processor and pulse until well combined. Stuff each mushrooms with 1-2 teaspoons of the mixture. Sprinkle with remaining breadcrumbs. Bake for 20 minutes and cool slightly before serving. This recipe is courtesy of Dana Angelo White, RD, from Food Network. 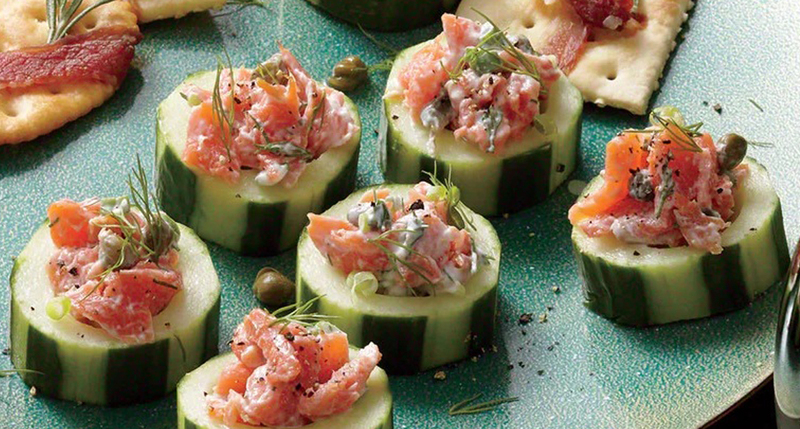 Serves 18; Serving Size: 2 cucumber cups. Enjoy 3 cups for less than 100 calories! Combine the first 4 ingredients in a bowl. Add 2 teaspoons fresh or ½ teaspoon dried dill to the mixture. Stir in chopped salmon. Spoon 1 tablespoon salmon mixture into each cup. Sprinkle cups with remaining dill and black pepper.